Every morning I make a smoothie to start the day. I love that they are easy to make, give me the energy I need for the day and I can throw them in a to go cup if I need to. I have tried a lot of combinations of smoothies, but this one is hands down my favorite. It is has all the flavor but not the crazy amount of calories of a smoothie from a smoothie chain. My kids beg for bites of this one and are always sad if I make another flavor. There are a couple of ways to make this smoothie. The first involves using fresh fruit and also a handful of ice. The second way is the way I prefer to make my smoothies, so they aren’t watered down at all. Slice a pineapple and mango in to chunks. Hull strawberries. Place on a cookie sheet lined with parchment paper. Freeze over night. 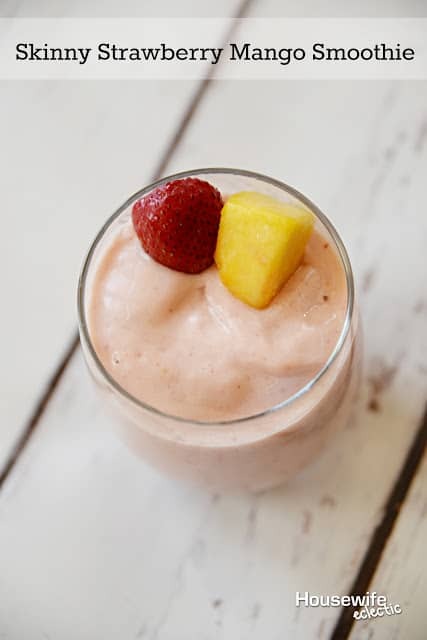 Throw 3-4 chunks of pineapple, 3-4 chunks of mango and 2-3 strawberries in your smoothie and blend. If you want to make it really easy I believe most stores sell frozen fruit with this combination, but I love freezing my own. Do you drink a smoothie in the morning? That sounds like a tasty smoothie. I love that it's a bit healthier, too. I have not had a smoothie in so long but I love them. Especially since they are healthy and delicious! It's been awhile since I drank (or made) a smoothie. But I prefer to make them your way as well, with frozen fruit rather than ice. This combination sounds yummy! This looks yummy and healthy and like a great way to use up fruit before it spoils. Sounds delish, but I wonder about the sugar content? It may be fine, just over all curious. I love the idea of freezing the fruit! You had me at Mango. I ate so much mangoes when I was younger and I still can't get enough of them. I love smoothies and try and have one daily. My favorite is definitely strawberry banana though. My fav fruits are mango and strawberry. Loving that this is a "skinny" version too. 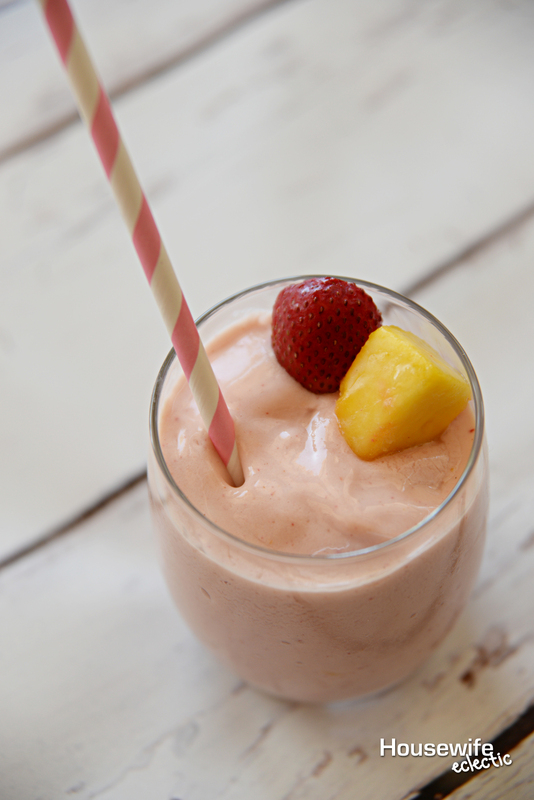 Strawberry and pineapple sound good to me! I haven't made a smoothie in a long time, but I should start up again! Omg this smoothie looks so yummy!!! I use to be a huge smoothie drinker. Now that my mornings are so hectic with taking my daughter to school etc… Ughhh… I need to start making them again! Yum! Match made in smoothie heaven. Now I'm in the mood for one of these! That smoothie looks so amazing. I can't wait to try this skinny version. I love strawberries and mangoes, but never tried the two together. That shall change sometime soon! Im a newcomer to mango…. and this sounds delicious! Cant wait to try one for myself! This sounds yummy! I cant wait to try it and it sounds low on sugar. That looks good! Thanks for sharing at Merry Mondays! You and I are making the same smoothie. It's my favorite flavor combo! thanks for sharing at Merry Monday. 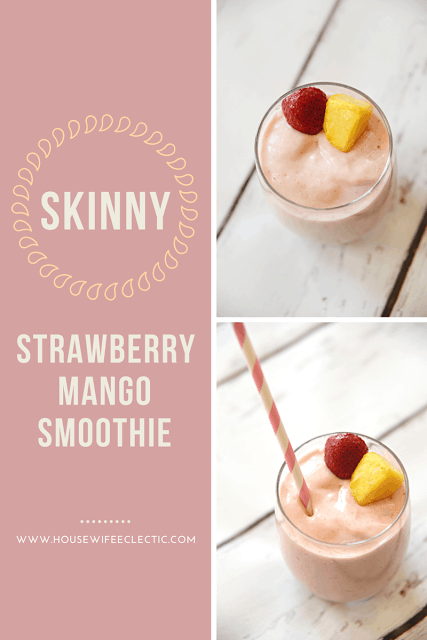 You just can't go wrong with strawberries and mangoes, I love the addition of almond milk to this! I'm not usually much of a smoothie person but this looks yummy! Thanks for linking up with Delicious Dishes Recipe Link Party!